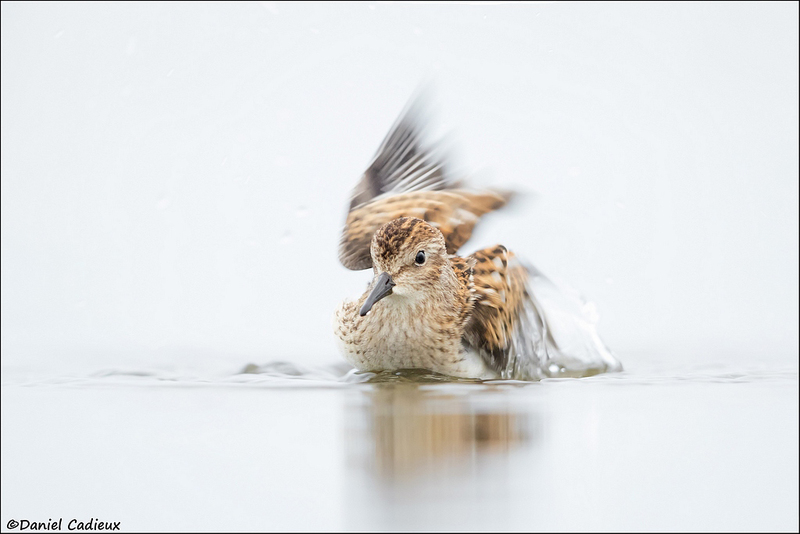 Knowing your subjects’ behavior is an important factor in bird photography, and the “after-bath wing flap” is a perfect example. Many birds, especially the water-loving kinds, regularly bathe in shallow water as part of feather maintenance. Coming upon one that is bathing is a bonus opportunity that will yield many entertaining photographs, for a couple of specific behaviors that come with it. Semipalmated Sandpiper, Canon 7DII + 500mm f/4II + 1.4TC III, manual exposure, evaluative metering, 1/1600s., f/5.6, ISO 1600. The first reason is, obviously, the actual bathing part. This can last as short as a few seconds, or as long as a minute, or more. The action is usually fast and fun. The head dunks in the water repeatedly, the wings slap the water furiously, and the water action is flying in all directions. During this sequence it is easy to become over eager and “machine gun” it through until the camera’s buffer is full. This is not the best strategy as you may miss even better action while the camera is disabled due to it emptying its’ buffer onto the card. For me, the best way to go at it is to time the image taking when the bird dips its’ head in the water and fire 5-6 frames. The head is in the water for only a fraction of a second, but you will get the “pop up” and initial, more dramatic wing flapping action. Stop for a moment, then depress the shutter again for another 3-4 frames again if the action is still good. Repeat as necessary. Least Sandpiper, Canon 7DII + 500mm f/4, manual exposure, evaluative metering, 1/320s., f/4, ISO 1600. 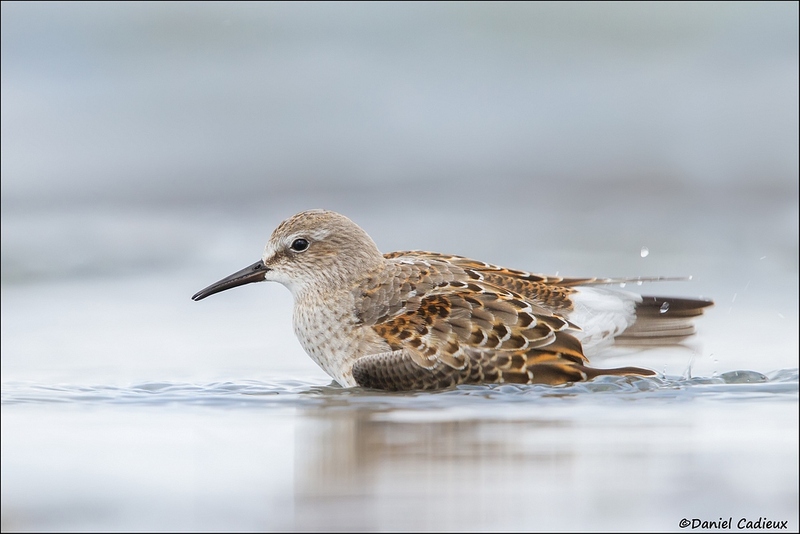 White-rumped Sandpiper, Canon 7D + 500mm f/4 II + 1.4TC III, manual exposure, evaluative metering, 1/500s., f/5.6, ISO 1600. Second, there will come a time when you will be able to predict when the subject has completed the bathing part and will, 9 times out of 10, effectuate the obligatory “after bath” wing flap. It is short in duration (often less than a second), intense, and results in dramatic images. While the bird is bathing look for a pause in the action, and then, often, the neck raising a bit, as well as the overall posture (is if standing tall after crouching), and a slow and slight raise of the wings at the shoulder. When observing these potential clues, you know the bird will likely flap its wings to rid itself of excess water on its feathers. Semipalmated Sandpiper, Canon 7DII + 500mm f/4II + 1.4TC III, manual exposure, evaluative metering, 1/1250s., f/5.6, ISO 1600. – Stay as low as you can. This will minimize background distractions, if any, and will also give you a beautifully intimate perspective of the action. – Use the same “wind and sun” direction as when photographing flying birds, that is, keep the wind and the sun at your back. Most birds, especially ones in open areas, like to face the wind when going about their activities, and same goes to bathing and wing flapping. This way you will have birds facing you, rather than away, and the sun at your back allows for better subject illumination. When cloudy sun direction is less critical, of course, but wind direction remains of importance. – Use the central focus point, and keep that focus point on the subject’s face. Despite the fast action of a wing flap, it is remarkable how they can keep their faces rather steady. – Keep enough room all around the subject. The raised wings take up lots of real estate, and you risk clipping some off if composed too tightly. That may mean the subject can be a touch small in the frame while it is performing the actual bathing. If your main goal is to photograph the bathing, than by all means move in, but keep in mind the wing flap may be a bust photography-wise. 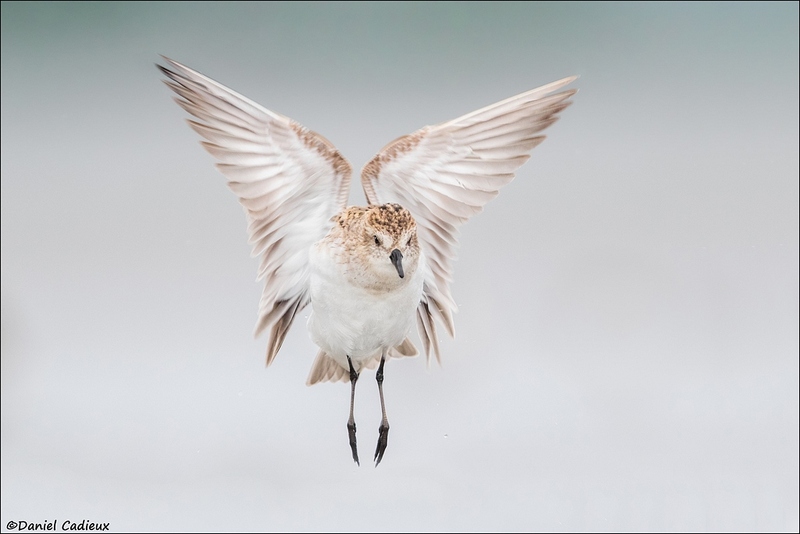 – When anticipating an oncoming wing flap, point your lens up a bit, or lower your focus point down a level or two, to place the subject a bit lower in the frame. This will better your chances at getting the whole bird in the fame during the “jumping phase of the flap”. Some birds will jump rather high depending on wind speed and strength of the wing flap, and will move out of the frame no matter how hard you try, it’s simply part of the game! The next one may stay lower, but at least you will have yourself a better chance. – During the wing flap, now is the time to “machine gun” the shutter. The action is usually not long enough to fully fill the camera’s buffer, and you will have a nice variety of poses to choose from to process. Semipalmated Sandpiper, Canon 7DII + 500mm f/4II + 1.4TC III, manual exposure, evaluative metering, 1/1000s., f/5.6, ISO 1600. 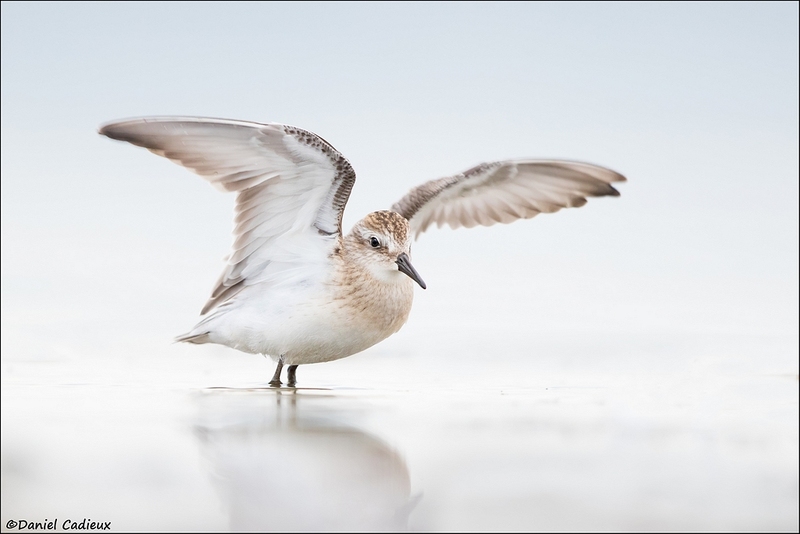 Sanderling, Canon 7D + 100-400L @300mm, manual exposure, evaluative metering, 1/2500s., f/6.3, ISO 400. The image directly below is the result of being too close to the bathing Black-bellied Plover. Luckily I was able to crop during post processing to make it look like an intentional cut rather than an accidental clip, which nicely put the black axillaries into evidence. More often than not, though, it means an image tossed into the trash can. 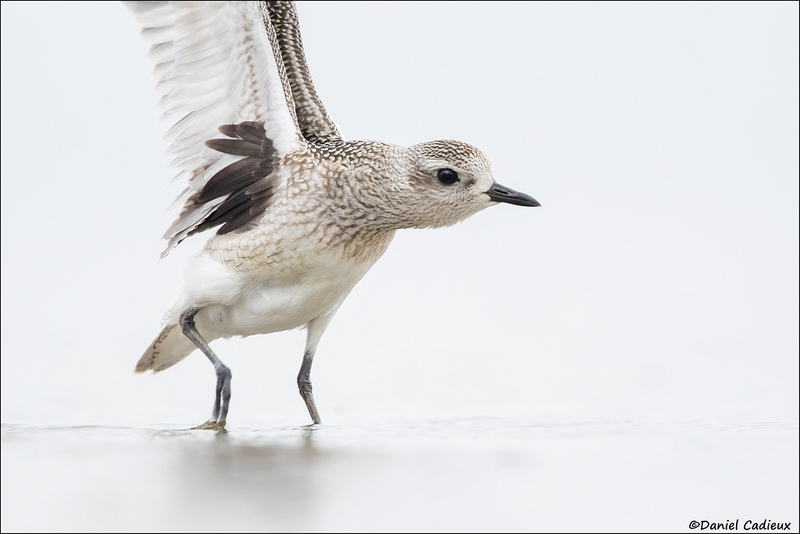 Black-bellied Plover, Canon 7DII + 500mm f/4 II + 1.4TC III, manual exposure, evaluative metering, 1/320s., f/5.6, ISO 1600. In the image above, and the next two below, note the rather slow shutter speed used despite action behavior. 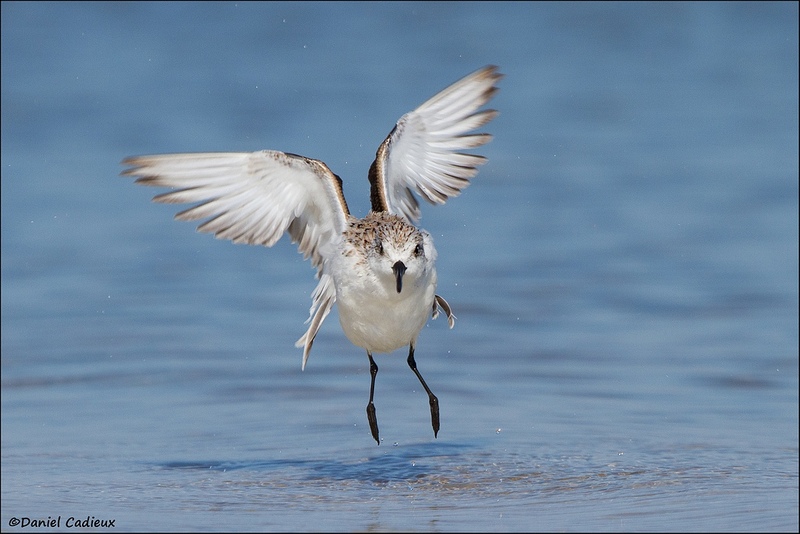 As noted earlier, shorebirds can hold their heads remarkably steady during wing flaps. 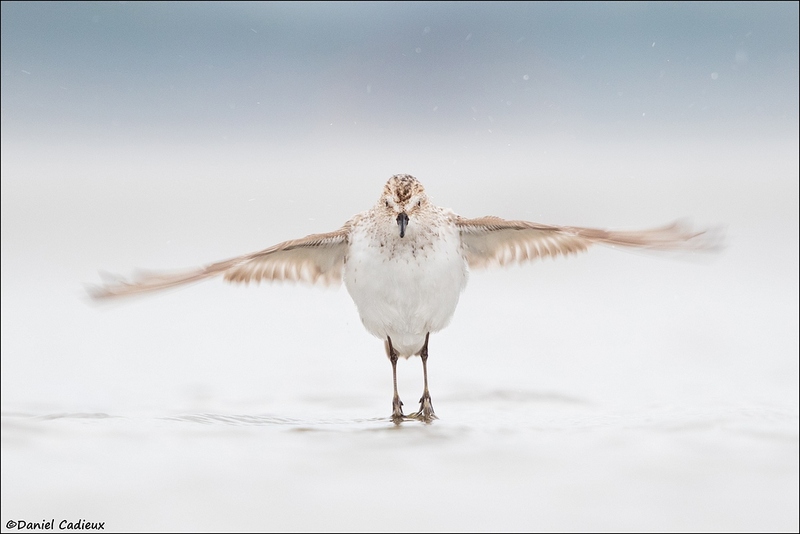 Semipalmated Sandpiper, Canon 7DII + 500mm f/4II, manual exposure, evaluative metering, 1/125s., f/4, ISO 1600. 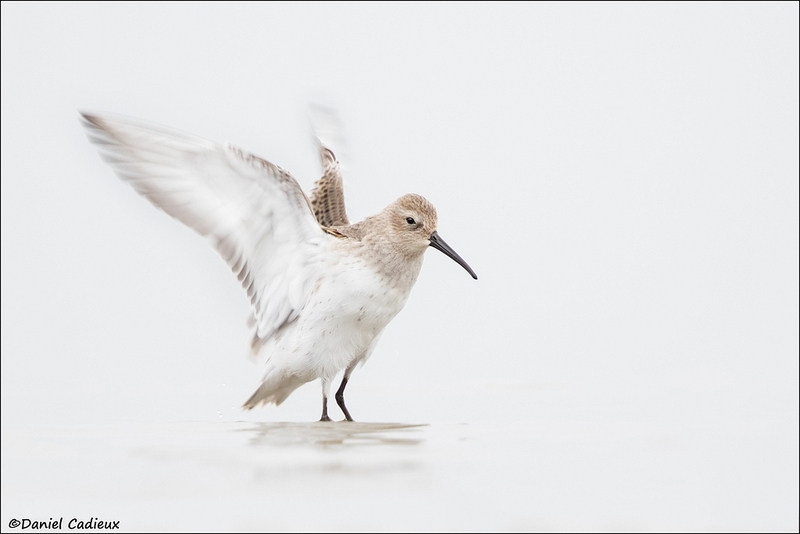 Dunlin, Canon 7DII + 500mm f/4 II + 1.4TC III, manual exposure, evaluative metering, 1/500s., f/5.6, ISO 1600. 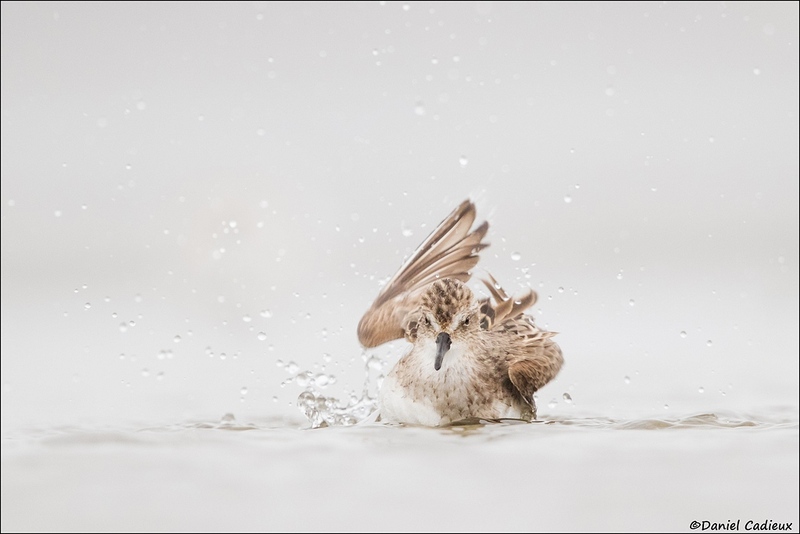 Hopefully this blogpost helped you realize that happening upon a bathing shorebird is an opportunity to pounce on, and that one or more of the tips I’ve offered can help in getting some good images out of the behavior. Although I kept it to shorebirds for this short article, do keep your eyes peeled for similar situations with gulls, terns, ducks, geese, swans, and other water-loving birds, which all, from time-to-time, like to bathe and flap…although the larger waterfowl will make it easier for you by not jumping during the flap! I start in animal photography, especially birds. I live in Abitibi. For the firt time I made shorebirds. I saw your photo on FLICKR .Your photos are wonderfull and fantastic. I read your blog about shorebirds. Thank you for all this informations that I will practice tomorrow. I was wondering about your photos, about the treatment of your photos (white). How do you do it? if its not a secret….. I must tell you I used google traduction, to understand your blog, and to write to you because I speek french. Bonjour Marie, je parle français aussi, donc voici ma réponse dans ta langue comfortable. Premièrement, merci beaucoup pour les compliments! Pas de secrêts dans moi pour la photographie: pour les blancs, la première chose c’est que j’aime beaucoup la lumière “douce” naturel, ce qui veut dire que j’aime beaucoup les conditions nuageuses. Ceci diffuse la lumière très bien, et aide à garder les ombrages au minimum. J’expose mes images le plus vers la droite possible, soit avoir de l’information jusque dans la 5ième boite à la droite de l’histograme (Canon). Si je doit réduire l’exposition dans photoshop ensuite, bien c’est correcte avec moi et cela donne d’excellent résultats. Si le soleil est sorti, j’essaie de le gardé le plus directement en arrière de moi. Pointe ton ombrage vers le sujet que tu photographie le plus possible. Dans le poste-traitement (photoshop) j’aime beaucoup les outils “dodge” et” burn” pour nivelé la lumière si les ombrages sont trop creux. Ceci n’est que quelques indices, mais j’espère que cela pourra t’aider! I used these tips yesterday at the beach to produce some nice images. Hi Allen, that’s great! It’s always satisfying when things go according to plan.